Cars don’t come cheap and most of the people have invested their lives in saving money and buying a car. There is no point to mourning over a stolen car when you can take safety measures before any mishap. Here we will discuss 7 simple ways you can use to prevent automotive theft. Most of the automotive thieves are looking for cars parked on the streets. They don’t want to break into garages and take additional risk. One of the highly suggested ways to prevent the car is by parking it in a garage. Those living in cities shall look to rent a garage. Although, it is not the cheapest of the options, but it is not more than your car’s safety. An alarm system can be helpful to quite an extent. This system is difficult to track and can scare the thief. The alarm system will start as soon as someone would touch your car. Automotive thieves would not wait for someone to come out when the alarm starts ringing and they will flee the scene right away. If you don’t wish to install this system, just an alarm sticker or a blinking LED will do the trick. It will give the impression that the car has an alarm system installed. External steel locks are being used around the world. These are giant metal bars that keep the steering wheel from moving. These are available in different shapes. However, the purpose of all of them is same. You should choose the one that offers maximum protection. The only drawback of these steering locks is that they are notoriously easy to defeat but they can compel the thief to steal someone else’s car. The biggest challenge that the car thief faces is starting the car without the keys. Hidden kill switches make the car ignition system difficult to play with. These switches can be placed anywhere and should not be prominent. The car thief would not spend much time looking for the switch and would leave your car immediately after trying several times. The best place to have this switch is under the driver’s seat. Besides all the above ways, if you are looking for the best one, you should get transponder keys for your car. Although most of the new cars have this system installed in them, you can get this installed in previous model cars as well. These keys have certain resistors which provide the exact amount of resistance needed to start the car. 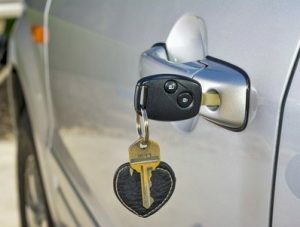 If fabricated keys are used to start the car, the car would stop automatically and even the right key would not be able to start it for a certain time. Who can drive a car without a steering wheel? No one. Having a quick-release hub in your car will allow you to take your steering wheel with you and even if someone breaks into your car, they would not have anything they can drive with. 7. Hire an automotive locksmith. Automotive locksmiths have extraordinary abilities to open car doors. They are also the best people to ask for advice on how to secure your particular vehicle make and model. Contact your local automotive locksmith today. These are 7 simple ways to prevent automotive thefts and keeping your car safe. For more information and useful tips be sure to read all of our other articles on our locksmith blog. 7 ways to prevent automotive theft https://georgetown-locksmith.co/7-ways-prevent-automotive-theft/ 3.8/5 based upon 16 reviews.